So you have your first 26.2 under you belt, and you’re looking for your next challenge. If you’ve truly been bitten by the marathon bug, why not start building a bucket list of some of the best races in the world?! It’s one thing running your local marathon, it’s a whole different experience running one in another city. 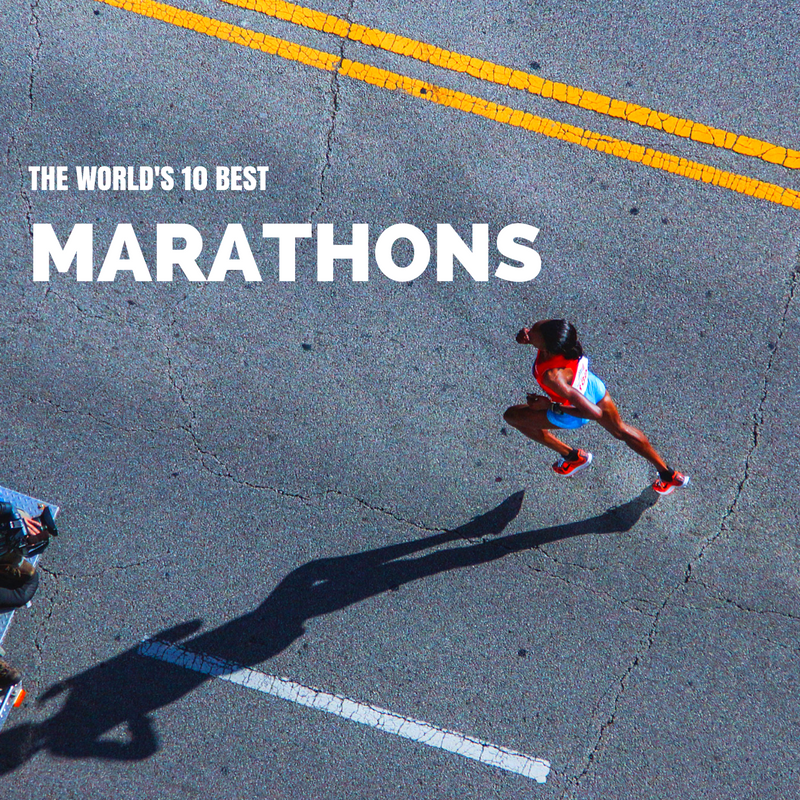 In today’s post we look at the best 10 marathons that should be at the top of you bucket list. Of course we had to start with our local race! 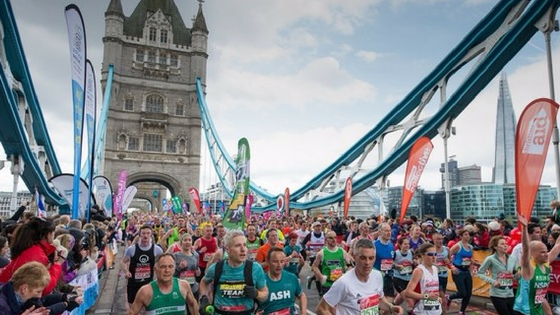 Every year, more than 30,000 people run the 26.2-mile marathon through the streets of London. Last year saw close to 40,000 runners on the starting line, after almost 250,000 people entered the 2016 marathon ballot. The first half of the route runs just south of the Thames through Greenwich and Blackheath. After crossing the river on Tower Bridge, runners pass some of the capital’s famous landmarks, including the Coca Cola London Eye and the Tower of London, before finishing in front of Buckingham Palace. If you haven’t done the London Marathon yet, bottom line, you need to. It’s a lifetime experience that you will never forget. The Boston Marathon is the oldest annual marathon in the world and, for everyday runners, the most prestigious. Since 2015, 30,000 runners take on this iconic race annually but in 2014, the year after bombings at the finish line, there was a one-time expansion to 36,000. Although women weren’t officially allowed to register until 1972, the field is now almost evenly split between men and women. Of the race’s 30,000 entrants, roughly 80% are time qualifiers and roughly 20% are charity runners. If you want to run the Boston Marathon, you will most likely have to run a great qualifier first. To find out what requirements you need to meet to take part, check out the official BAA website’s qualifying standards. 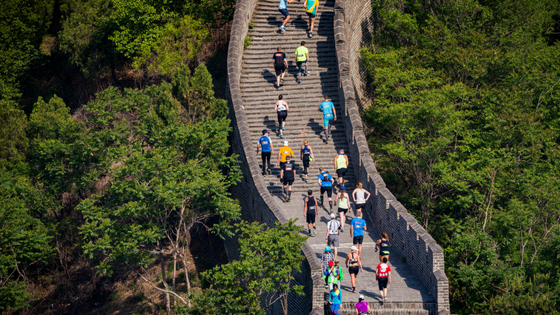 Since its inception in 1999, the Great Wall Marathon has become known as one of the world’s most difficult marathons. Runners have the opportunity to take part in one the most challenging marathon of their lives along one of the world’s greatest monuments. Since the inaugural Great Wall Marathon in 1999, turnout has grown steadily to a sellout event with 2,500 runners from over 60 nations. The Great Wall Marathon has no equal in terms of historical significance, and is an event that separates the tourists from the adventurers. It will test you like no other race, more than 10,000 unrelenting stone steps combined with a full marathon distance run, you won’t find another event like this on the planet. The Comrades Marathon in South-Africa is world’s oldest and largest UltraMarathon, run over a distance of 56.1 miles, between the coastal city of Durban and Pietermaritzburg. The race alternates yearly between the “up run” from Durban and the “down run” from Pietermaritzburg. Victor Clapham, to honour his fallen comrades during the Great War, initiated the race. The first Comrades Marathon took place on 24th May 1921, starting outside the City Hall in Pietermaritzburg with 34 runners. It has continued since then every year with the exception of the war years 1941-1945. The Wall of Honour is situated along the Comrades Marathon route at a point where the road overlooks the Valley of a Thousand Hills. It was created to serve as a permanent landmark to commemorate the achievements of Comrades Marathon runners who completed this epic journey. Runners who successfully finish the marathon can purchase their own block. Their performance is memorised on a plaque, which records the name, race number and status of the runner. Not for the feint of heart, the Marathon des Sables is a multi-stage adventure through the Sahara desert. You’ll be put to the test alongside 1,000 other participants – 150 miles of running, walking and trekking over 6 days. That’s the same as five and a half marathons! You’ll experience extreme conditions in 120 degrees Fahrenheit while carrying everything you need to be self-sufficient including food, clothing and medical supplies. A true bucket list challenge for the seasoned ultra runner looking to take on one of the toughest tests of human endurance there is. The Fire and Ice Ultra in Iceland is certainly a very special race, not only for the challenge it will pose to those participating but also for the incredible raw and extreme beauty of the Icelandic environment in which the event takes place. The 250 km 6 day stage race starts near Europe’s largest glacier (The Vatnajokull Glacier), then winds its way north through Iceland’s most extreme and remote landscape. Runners will be taken across multiple types of terrain including boiling mud pools, volcanoes, spurting geysers, glaciers and water falls in a truly unforgettable experience. Take it back to where it all began! 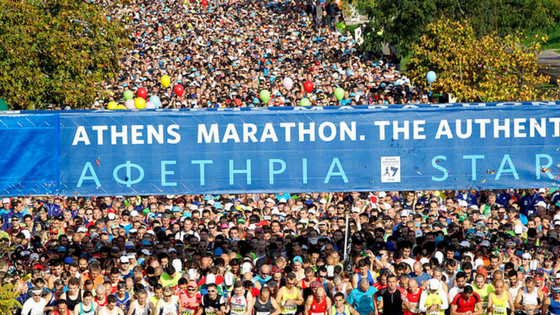 According to legend, the Athens Marathon covers the same ground that the Athenian messenger Phiedippides ran when he brought news of victory from the battlefield of Marathon 2,500 years ago. When you run the Athens Marathon, you run in the very footsteps of the ancient gods and heroes that gave birth to western civilisation. The finish line is in Athens’ magnificent Olympic Stadium, the birthplace of the modern Olympic Games. Unlike the other five marathons in the World Marathon Majors, the Tokyo Marathon started as a massive race from its first year. Over 25,000 runners finished the Tokyo Marathon in its inaugural year of 2007. Five years later, in 2012, nearly 36,000 runners started the race which travels through the main tourist attractions of Tokyo. Historically, Japan is known for its elite marathon races with very strict qualifying standards. The Tokyo Marathon is a very unique marathon; it is the only marathon in Japan that matches both the elite field depth and mass participation base of the other major marathons in the world. The marathon in the world’s most isolated country is a rare chance for foreigners to interact en masse with North Koreans. It has been open to amateur foreign runners since 2014. Foreign tourists visiting North Korea are forbidden from roaming freely there, with local guides employed by state-owned tour companies accompanying them at all times. Dictatorial leader Kim Jong Un keeps a tight reign on foreign influence seeping into the country, which only has around 5,000 western tourists visiting each year. If your looking for a truly unique experience and like to live life on the risky side, this is the one for you! The Barkley Marathons, the famed adventure race in the Cumberland Range of Tennessee that’s more a test of will than standard ultramarathon, does what it does best: crush participants’ bodies over 60,000 feet of elevation gain and push runners to their limit. Very little is known about the race outside the extreme ultra running community and those that have taken part previously. The best advice that I can give you is to watch the documentary on Netflix about the Barkley Marathon as the event is shrouded in mystery. You won’t regret watching it! Have we missed any of your favourites? Let us know in the comments below!